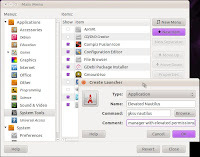 In the Ubuntu file system, you can use Nautilus file manager to browse most files but can only write files in your own home folder and sub-folders such as Desktop and Documents. If you have to perform file operations outside of your home folder using the Nautilus file manager, you'll get errors owing to insufficient write permissions. If you've got sudo nautilus in the command buffer of every terminal session it might be time to create a launcher for Nautilus with elevated permissions. I've chosen to create mine in the "System Tools" menu group in the left panel, highlighting that then selecting "New Item" on the right panel. Give the launcher a name such as Elevated Nautilus in the "Name" box. in the "Command" box. This will run the file manager as Root. Select "OK" button and "Close" button. 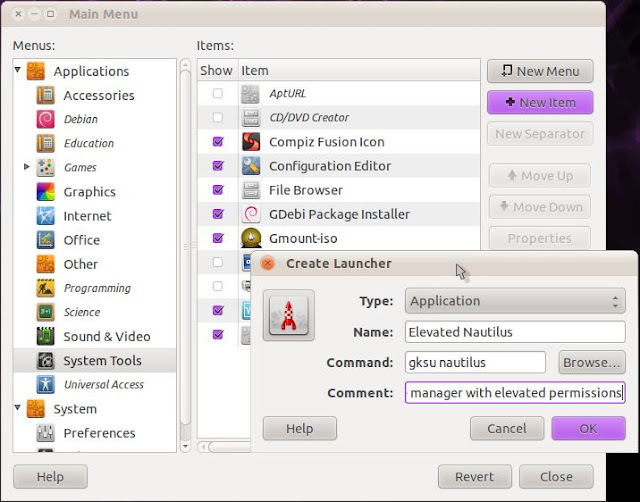 You can now go to Menu > Applications > System Tools and find the Elevated Nautilus launcher in place. You will need to enter an admin password to activate it.